By S. Srinivas Ganapathy, M.D., Paul Wong, M.D., Lena Naffaa, M.D. A 12-year-old child presented with headaches for 3 months, gradual onset of blurred vision, and strabismus in the right eye. The patient had bitemporal hemianopia and severe vision loss in the right eye on exam. Central hypothyroidism (low free T4 and normal TSH) and adrenal insufficiency (low serum cortisol and low sodium) were the endocrine abnormalities present. 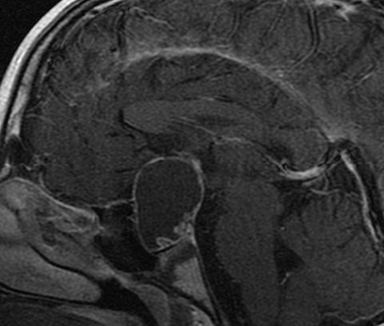 This prompted further evaluation by computed tomography (CT) and, subsequently, MRI with contrast (Figure 1 A-D). Suprasellar masses have a wide differential diagnosis that can be narrowed based on patient age; clinical presentation; imaging characteristics including the presence of calcifications, cystic content of the mass, and patterns of enhancement; sellar extension; and appearance of the infundibulum. The differential diagnosis of a cystic suprasellar mass in a child includes more common etiologies such as craniopharyngioma and Rathke’s cleft cyst, as well as less common entities such as a necrotic pituitary adenoma, cystic glioma, and suprasellar arachnoid cyst. Craniopharyngioma. Craniopharyngiomas are benign epithelial tumors known to arise from the squamous rests along the remnants of the hypophyseal-Rathke (craniopharyngeal) duct. They are most commonly suprasellar in location but can also be mixed intra-suprasellar or, rarely, purely intrasellar. Varying locations occur because they can arise anywhere along the pituitary stalk from the floor of the third ventricle to the pituitary gland. A small number of craniopharyngiomas can be ectopic, located in the third ventricle, nasopharynx, or sphenoid sinus. Giant craniopharyngiomas are known to extend into the anterior, middle, or posterior cranial fossae. Craniopharyngioma is the most common nonglial pediatric intracranial tumor and comprises over half of all pediatric suprasellar tumors. The peak incidence is between 10-14 years of age (adamantinomatous subtype) with a second peak in the 4th to 6th decade (squamous-papillary subtype).1 The most common symptoms at presentation are headaches, visual field defects, or anterior pituitary dysfunction. The surgical approach to craniopharyngiomas varies depending on the pre-chiasmatic or retro-chiasmatic location of the tumor. The tumor has a good 10-year overall survival rate, although the rate of recurrence is high and can be greater than 80% if the original tumor was greater than 5 cm.4 Recurrence may occur within the tumor bed or along the surgical tract. Rathke’s cleft cyst. Rathke’s cleft cysts are embryologically related to craniopharyngiomas, as they are derived from the remnants of Rathke’s pouch. They are cystic intra or suprasellar masses, similar to craniopharyngiomas, but do not enhance or have calcifications. They are smaller when compared to craniopharyngiomas and are just anterior to the pituitary stalk insertion, most often in the region of pars intermedia. Despite the cystic nature (typically low T1 signal and high T2 signal), Rathke’s cleft cysts can also be T1 hyperintense and iso- to hypointense on T2-weighted images due to proteinaceous content. A nonenhancing intracystic nodule having high signal intensity on T1-weighted images and low signal intensity on T2-weighted images was observed in 77% of the cases in one series; if present, it is a helpful feature to distinguish these lesions.5 Rathke’s cleft cysts are mostly asymptomatic in childhood. However, they can occasionally present with pituitary dysfunction, visual disturbances, or headaches due to compression of the pituitary gland or suprasellar structures. 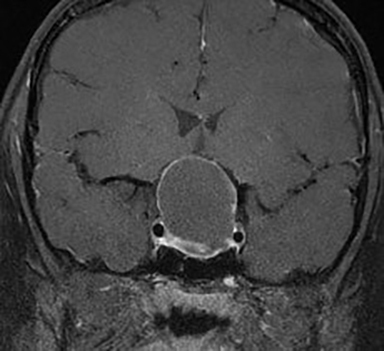 Pituitary macroadenoma (necrotic). Pituitary macroadenomas in children are more common than microadenomas. However, an adolescent pituitary gland can be enlarged normally due to hormonal influences with an upward convexity resembling an adenoma, but without differential enhancement or extension. Pituitary macroadenomas can expand the sella and extend into the suprasellar region. They may also show hemorrhagic or proteinaceous cystic changes with T1 hyperintensity, mimicking craniopharyngiomas, but they rarely calcify. The solid portions typically enhance uniformly, whereas the necrotic, cystic, or hemorrhagic portions do not. Macroadenomas can expand laterally and invade the cavernous sinus. When hemorrhage or apoplexy occurs in suprasellar adenomas, susceptibility-weighted sequences are helpful to identify blood products, which can be markedly hypointense on T2-weighted images.6 Pituitary apoplexy is an emergency that can result in permanent visual loss if not immediately addressed. Chiasmatic/hypothalamic glioma. Chiasmatic/hypothalamic gliomas or astrocytomas are markedly T2 hyperintense and hypointense on T1-weighted images. The large, bulky chiasmatic gliomas are often heterogeneous with cystic and enhancing solid components. They may infiltrate or extend along the optic chiasm and into the optic nerves, tracts, or radiations, rather than displacing them as is the case with craniopharyngiomas—a key distinguishing imaging feature. Lesions may occur sporadically or in the setting of neurofibromatosis type 1 (NF1) in which case there is an increased incidence.7 Occurrence before age 5 in a patient with cutaneous stigmata of NF1 favors a diagnosis of astrocytoma over craniopharyngioma in this location. Arachnoid cyst. Suprasellar arachnoid cysts are congenital lesions that can expand by cerebral spinal fluid secretion. The cyst wall may be imperceptible on CT and even on MRI. 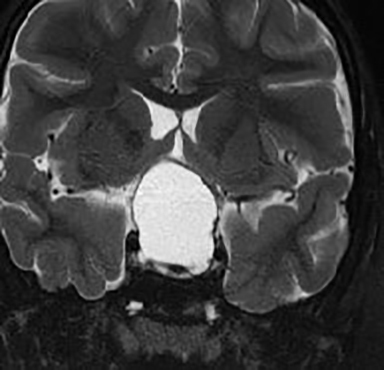 Arachnoid cysts do not show contrast enhancement, solid components or calcifications.8 Suprasellar arachnoid cysts, like craniopharyngiomas, can expand in all directions and can displace the third ventricle. They may disrupt the pituitary stalk and compress the hypothalamus. Arachnoid cysts can typically be distinguished from other entities in this location by their isointensity to CSF on all sequences. Additional considerations. Other entities to consider in the differential of a cystic suprasellar mass include dermoids/epidermoids and teratomas, although they are less common midline lesions. Dermoids and teratomas often show presence of fat on CT or MR. Epidermoids are solid lesions that can mimic cysts, but show characteristic restricted diffusion. The enhancement is minimal, if at all present.9 The ectopic craniopharyngioma arising from the sphenoid sinus can be distinguished by the presence of calcifications, as opposed to a sphenoid sinus mucocele, which typically lacks calcifications. Sphenoid sinus mucoceles primarily arise in the sinus completely filling it and can cause bone destruction. Other suprasellar masses, such as a meningioma, aneurysm, Langerhan’s cell histiocytosis, germinoma, hamartoma, and chordoma most often do not have a predominantly cystic appearance. A cystic suprasellar mass with calcifications and enhancement of the wall or solid portions in a child or adolescent is almost always a craniopharyngioma. It is important to recognize the various locations along the hypophyseal-Rathke duct from which these tumors can arise and extend into multiple cranial fossae. 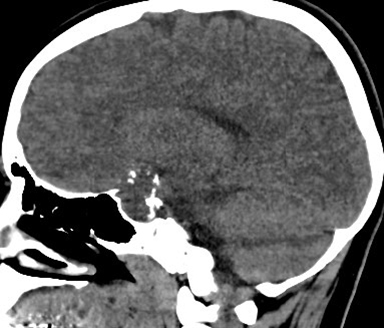 The presence of calcifications, a distinguishing feature of craniopharyngioma, as opposed to several other entities in this location, is best depicted by CT, which is a valuable complement to MRI. When interpreting postoperative studies, one should be cognizant of the high recurrence rate of pediatric craniopharyngiomas either in the tumor bed or ectopically along the surgical tract. Sartoretti-Schefer S, Wichmann W, Aguzzi A, et al. MR differentiation of adamantinous and squamous-papillary craniopharyngiomas. Am J Neuroradiol 1997;18(1):77-87. Fitz CR, Wortzman G, Harwood-Nash DC, et al. Computed tomography in craniopharyngiomas. Radiology 1978;127(3):687-691. Sutton LN, Wang ZJ, Wehrli SL, et al. Proton Spectroscopy of suprasellar tumors in pediatric patients. Neurosurgery 1997;41(2):381-395. Eldevik OP, Blavias M, Gabrielsen TO, et al. Craniopharyngioma: radiologic and histologic findings and recurrence. Am J Neuroradiol 1996;17(8):1427-1439. Byun WM, Kim OL, Kim D. MR imaging findings of Rathke’s cleft cysts: significance of intracystic nodules. Am J Neuroradiol 2000;21(3):485-488. Poussaint TY, Barnes PD, Anthony DC, et al. Hemorrhagic pituitary adenomas of adolescence. Am J Neuroradiol 1996;17(10):1907-1912. Medlock MD, Madsen JR, Barnes PD, et al. Optic chiasm astrocytomas of childhood. 1. Long-term follow-up. Pediatr Neurosurg 1997;27(3):121-128. Al-Holou WN, Terman S, Kilburg C, et al. Prevalence and natural history of arachnoid cysts in adults. J Neurosurg 2013;118(2):222-231. Harrison MJ, Morgello S, Post KD. Epithelial cystic lesions of the sellar and parasellar region: a continuum of ectodermal derivatives? J Neurosurg 1994;80(6):1018-1025. Ganapathy SS, Wong P, Naffaa L. Cystic Suprasellar Mass. J Am Osteopath Coll Radiol. 2016;5(1):23-25. S. Srinivas Ganapathy, M.D., Paul Wong, M.D., Lena Naffaa, M.D. Drs. Ganapathy, Wong and Naffaa work with the Department of Radiology, Akron Children’s Hospital in Akron, OH.